The purpose of CONTEMPLATION is to bring you heretofore little known repertoire of great historical significance, in both craft and meaning. Liszt was the great experimenter of the 19th century and his output reflects such a wide variety of writing devices and sentiments that, once unearthed, we cannot be without it. A lot of the pieces that fit the harp come in an assortment of reflective moods, hence the title. Despite Liszt's reputation as a showman, the tone is all about "Innigkeit", the romantic notion of "the fire smoldering within" rather than without, a heartfelt, deep and intimate expression. Even though some of the works presented here will bear resemblance to the Liebesträume, the greater part stem from his later days, when his style became more sparse and allusive, leaving us to find meaning in between the notes and their echoes. 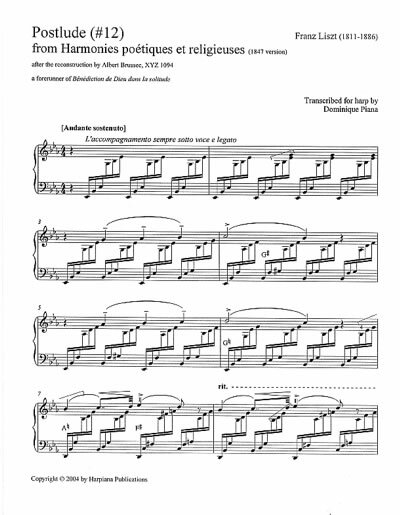 I have stayed faithfully close to Liszt's piano text, only modifying it when execution on the harp would be impossible or when I knew from the recorded history of his teaching or his own variants that a change would have met with his approval.